Syncplicity storage reports allow administrators to gain visibility into the storage utilization within their company account. If you have a Syncplicity Enterprise Edition account and you have configured on-premise StorageVaults, you can choose which StorageVault to run the report against, using the StorageVault selector dropdown (only visible for Syncplicity Enterprise Edition accounts). Each storage report is specific to the selected StorageVault. Select the radio button option that corresponds to the set of users you wish to include in the report results and either select to export the report or display the report directly on the screen. If you select to specify a specific user, start typing the user's name or email address in the input field and the autocomplete feature will help you locate the user. If you select the wrong user by mistake simply click the X icon to remove the selected user and start over. If you chose to display the report, the results will appear directly below the report parameter input area on the reports page. Initially the output is sorted by total storage consumed, from largest to smallest, but you can easily change the sorting by clicking on the appropriate column header. In the CSV output file for this report, the storage consumption row for each Syncplicity user in the result set will be repeated once with a Group Name set to "--" and then once for each Syncplicity group that the user is a member of. This will allow filtering and sorting of the rows by Syncplicity group, which could be used to perform analysis of the results for IT departmental chargebacks. If you would like a result set that contains just one row per Syncplicity user simply filter the results by the User: Group Name column to only display rows with the value "--". The Syncplicity user's full name. The Syncplicity user's email address. The Syncplicity user's status, which can be either Active or Disabled. Before running the report you are able to select whether the report should include users in both or only one status. Disabled users have had their account disabled by an Administrator, but their files are still stored within Syncplicity and count towards you account's consumed storage. The Name of the Syncplicity group that the Syncplicity user listed in the "User: User Name" column is a member of. For each user one row will include "--" for the group name (see explanation for this above). The storage quota (in bytes) applied to the Syncplicity user listed in the "User: User Name" column. Users who are part of multiple groups with a storage quota configured have the highest one applied to them, and so the value in this column does not necessarily originate from the group in the "User: Group Name" column. The total of the storage consumed (in bytes) by the Syncplicity user listed in the User: User Name column. This total is the sum of the storage consumed by the user's active files, previous versions of their active files and the files they have deleted but not yet emptied from their Syncplicity recycle bin. The storage consumed (in bytes) by all the active files owned by the Syncplicity user listed in the "User: User Name" column. Active files are the latest version of all files in Syncplicity folders that the user owns, and excludes previous and deleted versions of these files. The storage consumed (in bytes) by all the previous versions of active and deleted files owned by the Syncplicity user listed in the "User: User Name" column. Each time a new version of an active file owned by a user is uploaded to Syncplicity the previously active version of the file is retained. All previous versions of files (active and deleted) are retained, unless one of your account administrators has set up a Previous Version Retention Policy, or the files have been permanently deleted via the Syncplicity Online File Browser. The storage consumed (in bytes) by all the deleted files owned by the Syncplicity user listed in the "User: User Name" column. All deleted files are retained, unless one of your account administrators has set up a Deleted Items Retention Policy, or the files have been permanently deleted via the Syncplicity Online File Browser. The storage by file type report allows you to see which file types are consuming the storage you have purchased for your account and can be used to determine if your users are adhering to your Acceptable Use Policy. The report results are exported as a comma separated values (CSV) file. If you want to run the report for a specific group of file types click on the file type dropdown menu and select one of the available pre-defined group of file types. Selection of a file type group populates the custom file type input area so that edits can easily be made to the list of pre-defined file types before you run the report. Select the radio button option that corresponds to either all users or a specific user. If you select to specify a specific user, start typing the user's name or email address in the input field and the autocomplete feature will help you locate the user. If you select the wrong user by mistake simply click the X icon to remove the selected user and start over. In the CSV output file for this report, each row provides the storage consumption for each file type in the result set totaled across all the users in your Syncplicity account or the individual user that you selected before generating the report. File type name followed by the file type extension in parenthesis. If the file type name is not known by the Syncplicity system only the file type extension is displayed in this column. 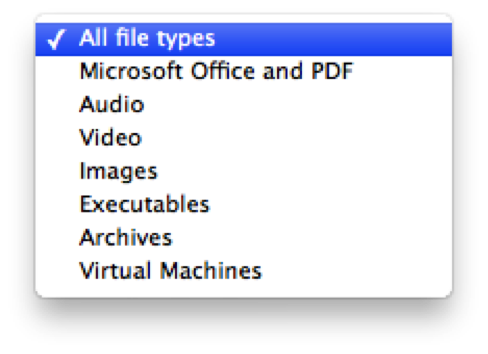 The total number of active files in the company account that are of the file type listed in the “File: Type” column. The total of the storage consumed (in bytes) by all files in the company account that are of the file type listed in the “File: Type” column. This total is the sum of the storage consumed by the active files, previous versions of active files and the files they have deleted but not yet permanently deleted, that are of the file type listed in the "File: Type" column. The storage consumed (in bytes) by all the active files in the company account that are of the file type listed in the “File: Type” column. The storage consumed (in bytes) by all the previous versions of both active and deleted files in the company account that are of the file type listed in the “File: Type” column. The storage consumed (in bytes) by all the deleted files in the company account that are of the file type listed in the “File: Type” column. The user storage by file type report allows you to see which users are consuming storage for a specific file type and can be used to determine if which users are not adhering to your Acceptable Use Policy. The report results are exported as a comma separated values (CSV) file. The report can be run for a single specified file type. Enter the file type extension to be included in the report output. In the CSV output file for this report, each row provides the storage consumption for the specified file type for each user who owns such files. The Syncplicity user's status, which can be either Active or Disabled. Disabled users have had their account disabled by an Administrator, but their files are still stored within Syncplicity and count towards you account's consumed storage.